Basecamp Classic: What is RSS and how do I use it with Basecamp Classic? RSS (Really Simple Syndication) lets you subscribe to specific content feeds and aggregate this information in one place to be read when you’re ready. Think of it as a feed of all your Basecamp project activities delivered to you so you can read through it when you want. If you’re curious, you can read more on RSS. To read an RSS Feed you’ll need newsreader software like NetNewsWire (for the Mac) or FeedDemon (for the PC). Once you have your RSS newsreader software, you can copy the URL/address for one of your Basecamp RSS feeds and paste that URL into the subscription option of your newsreader (note: some news readers, like NetNewsWire, lets you just drag a link directly into the program to add the news feed). You’ll now be subscribed to that RSS feed, and depending on how often you’ve set your newsreader to refresh the feeds, you’ll be kept up to date on your projects without having to log into Basecamp. Basecamp lets you subscribe to to a project’s RSS feed or your global (all projects) RSS feed. You will then be notified any time someone posts a message, comment, or file, or adds or completes a to-do item or milestone, or adds an event to a project. 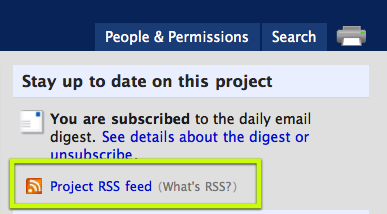 To subscribe to a project’s RSS feed, go to the project’s “Overview” tab and click the link that says “Subscribe to your project RSS feed” in the right sidebar. To subscribe to your global (all projects) RSS feed, go to your Dashboard and click the link that says “Subscribe to your project RSS feed” at the bottom of the page.